One of the most famous and largest festivals in Japan, the Sanja Matsuri in Asakusa is a must-see three day event in this historic downtown. Read on to learn more about the festivities, and the history of this incredible festival. What Is the Sanja Matsuri? Walk down the streets of Asakusa during mid-May, and you will likely see strands of paper lanterns strung around buildings and the streets and hear traditional Japanese festival music playing over speakers. One of the biggest annual events in Asakusa is the Sanja Matsuri or Sanja Festival. This festival is held in celebration of the three founders of Sensoji Temple. Every year, over 1.5 million visitors come to Asakusa to watch the festival, making this one of the most popular festivals in Tokyo. Historically known as Asakusa Jinja Reitaisai, the Sanja Matsuri is held every year on the third weekend in May. In 2018, festival events will be held from Friday, May 18th, to Sunday, May 20th. During the festival, portable shrines, known as mikoshi, are carried to Asakusa Shrine, which is located next to Sensoji Temple. Festival participants in the Sanja Matsuri carry these portable shrines and proceed around the town to honor the three founders of the shrine and temple - two fishermen who found the sacred statuette of the goddess Kannon enshrine at Sensoji Temple, and a wealthy land owner, who converted the fishermen to Buddhism and helped build the original temple. The festival itself is said to date back to the year 1312, giving it an over 700 year long history and firmly implanting it in the history of the Tokyo area. This historical event was worshiped both at Sensoji Temple and Asakusa Shrine until the Meiji era, when the separation of Buddhism and Shintoism occurred. To this day, however, the three founders are still strongly connected with Sensoji Temple, and many of the mikoshi used during this event are paraded about the main temple building as well. In Japanese, the word "san" means three. It is thus thought that the "san" in the name Sanja Matsuri, refers to the three people who contributed to the founding of Sensoji Temple. In 628, two fishermen brothers, Hamanari and Takenari Hinokuma found a Kannon (Goddess of Mercy) statuette in Sumida River. They returned the Kannon back to the river, but it kept getting caught in the fishing net repeatedly. They then consulted with Hajino Nakatomo, a wealthy scholar in the region. The scholar determined that the statuette was the Kannon itself. After this discovery, the three men devoted the remainder of their lives to worshiping Kannon, and founded Sensoji Temple. After their deaths, an oracle given by Kannon lead to the creation of Asakusa Shrine, where the three founders are themselves enshrined. You can see picture scrolls of this near Hozomon, in Asakusa Temple. A major event of the festival includes a dance called "Binzasara Dance," which is performed to pray for an abundant harvest and casting out evil spirits. It is officially recognized as an intangible cultural asset and is unique to the Sanja Matsuri. However, the most well known aspect of this event is the Daigoretsu, which is held on the Friday. The Daigoretsu, or "great parade", is a massive procession of people in costume, and crowds of worshipers, that fill the streets leading to and from the shrine. Thousands of people from across Japan and around the world come to take part in this event in particular. On the Saturday, about 100 mikoshi from the 44 regions surrounding Asakusa are carried to Kaminarimon, the great lantern gate at the front of the temple complex, before being carried to Asakusa Shrine to be blessed and then carried back to their respective hometowns. 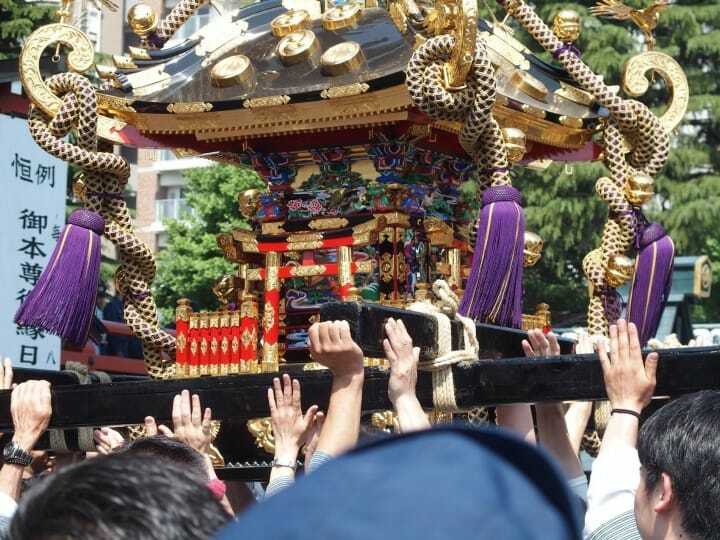 Finally, on Sunday, the most important religious event of the Sanja Matsuri takes place. The three founders are transposed into the three Honja Mikoshi, which are individually called "Ichinomiya", "Ninomiya" and "Sannomiya," and are paraded down to Kaminarimon, then split into three directions to visit the 44 regions of Asakusa. Every year, the areas where these three portable shrines are carried changes. This year, Ichinomiya will be carried in sixteen areas in the West, Ninomiya in sixteen areas in the South, and Sannomiya in twelve areas in the East. The portable shrines weigh about one ton each. 120 people carry each one of them and so the atmosphere around them is extremely exciting. If you can only attend part of the festivities, then Sunday is the day to go! Just be careful - you will be in for a lot of crowds if you do! To learn some insider tips about the Sanja Matsuri, check out Asakusa's Sanja Matsuri - 4 Important Tips From The Locals. Temple and Shrine Charms: What's the Difference? Get Your Wish Ready When Visiting Asakusa's Seven Lucky Gods! Let’s Learn About Asakusa’s Kaminarimon!